Spring is here. The flowers are blooming, and the sun is shining as you clean your home for a fresh start to the new season. As you deep clean the carpets and rid your home of clutter, there is something else that deserves a good cleaning – your mouth. There is no better time than now to recommit to your oral health by scheduling an appointment with your dentist in State College for a cleaning and checkup. You will have a healthy, beautiful smile all season long with preventive care from your dentist. Although your toothbrush and floss are your first line of defense against preventable issues, like tooth decay and gum disease, it is not enough to keep your smile healthy. The American Dental Association also recommends you visit your dentist at least twice a year for a cleaning and checkup. Unfortunately, one-third of Americans do not maintain their appointments. Often, it is thought you do not need to see your dentist until after a problem develops, but this could not be further from the truth. Routine care keeps your teeth and gums healthy to lower your overall dental expenses. In fact, every $1 you spend on prevention saves you $8 to $50 on restorative and emergency services. Often, you can get the care you need for minimal expense because most dental insurance plans cover cleanings and checkups 100%. Visiting your dentist regularly allows them to remove harmful tartar buildup on your teeth that can lead gum disease. It is estimated at least 50% of adults have a form of it despite it being preventable. A routine cleaning lowers your risk of the infection while your checkup can detect the early warning signs of it for prompt intervention. If gum disease is not treated quickly, it destroys the supporting structures of your teeth, eventually leading to tooth loss. Besides preventing gum disease, semi-annual appointments also protect your teeth from decay. At least 92% of adults have had one cavity in a permanent tooth. Your dentist can help keep your enamel strong to ward off decay with fluoride treatments or dental sealants. They can also detect areas of weakened enamel sooner to prevent it from turning into a cavity. 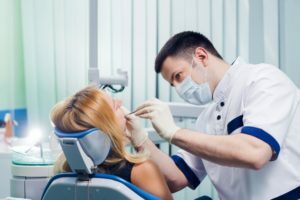 Not only does your dentist look for gum disease and tooth decay, but other issues that can compromise your oral and general health, like oral cancer. A complete checkup allows them to monitor your dental health to ensure your smile stays healthy and beautiful for a lifetime. If you have not been to your dentist in the past 6 months, a cleaning and checkup should be at the top of your spring-cleaning to-do list. Do not wait for a problem to develop. Schedule an appointment today. Donald Marks Family Dentistry strives to create generations of healthy smiles using a focus on preventive dentistry. We offer the complete services your loved ones need for healthy teeth and gums. If you need a cleaning and checkup, contact our office today for an appointment. by: Dr. Donald Marks at March 31, 2019 .